Cain explains where the American cult of extroversion and our misunderstanding of introversion originates. No field of study is left out of the discussion: from religion to pop psychology, from Harvard Business to Dale Carnegie, from Asian American High School students to FDR and Eleanor Roosevelt and from biology to personality theory, Cain coalesces her impressive knowledge, much of it from first person interviews and observations. Introverts, which, according to the book, comprise up to 50% of the American population, exist today not because of an anomaly of evolution. Where extroverts are driven by the belief that the early bird catches the worm or that opportunity only knocks once, the survival credo of the introvert is about betting on a sure thing and looking before you leap. Typically extroverts live by action and introverts by reflection. See the brilliant chapter 7 on why Warren Buffett has prospered. 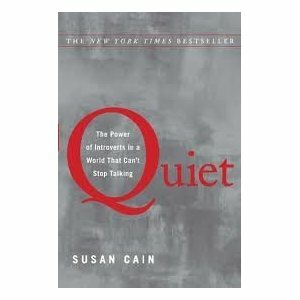 But the best of this book is when Cain takes on the myth that being or acting like an extrovert is synonymous with creativity. Cain maintains that, although the New Groupthink elevates teamwork above everything else, solitude is the key to creativity. The best ideas often do not come from brainstorming in a group, which often stifles individuality and honesty. The best work spaces are not necessarily open for all to see and hear. And the the best way to get work done is not necessarily in a team. Many skills, from chess to music to designing computers, are perfected in hours of what the book calls "deliberate practice." You don't get to be a soloist through more and more group rehearsals: you do it on your own because you can only work on what is challenging you when you're alone, for as long as it takes. One, intense concentration requires it, but other people can be a major distraction. Two, you practice on your own because you are self- motivated anyway. Finally, when you're alone, you can go directly to work on what's challenging you the most. That cannot happen in a group or class setting. Most of Cain's book is really excellent, and I found her descriptions of her experiences at various extrovert shrines very entertaining and even humorous. Her observations of Saddleback Church and a Tony Robbins seminar are not only funny, but also provide an excellent critique of how so many churches and self - help gurus become part of the same cultural matrix elevating the outer persona at the expense of the interior life. Churches have to find a way to affirm witness as authenticity and action instead of the right words. Much is said these days for the corporate spiritual practices, things we can do together. But not all things are best done with others! For Christians, prayer would be that core practice that requires deliberate, intentional alone time. Quiet. Centering. That is where we encounter and choose to overcome the blocks to greater freedom and movement. Even our own demons, whatever they may be. "Throwing this kind of spirit out requires prayer," Jesus taught his disciples. (Mark 9:29 CEB) Was Jesus speaking about those forty days alone in the desert wilderness with his own temptations? (Luke 4) It would seem so.